A low-pitched roof bungalow home is a romantic design that uses warmth and comfort as two of its guidelines for style. While typically a smaller square footage than its contemporary designs, a bungalow design places functionality as a high priority for all design elements. Furniture and furnishings offer tactile textures that bring that feeling of "home sweet home" to its owners. 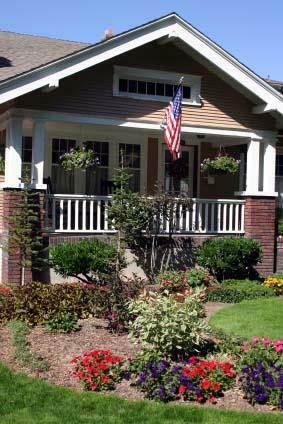 Charming front porches and inviting backyard porches are hallmarks of a bungalow design. The casual design places the living room in the front of the home with the front door opening directly into this space. The bedrooms open off the living room and kitchen, eliminating or minimizing the need for halls. Some designs offer only a breakfast nook while others have a designated dining room, depending on how large the space is. Start with the walls and floors and work your way toward the center of the room when working on your decorating scheme. Some of the styles that incorporated the bungalow design between 1900 and 1950 included Craftsman, Arts and Crafts, California, Western, Swiss chalet, Mission, Airplane, Spanish and English designs. Modified as a smaller home, the bungalow design became an iconic symbol for five decades. The Craftsman and Arts and Crafts designs were the most popular and the majority of interiors reflected these two styles. Use muted natural earth colors, such as sage green, soft yellow, light tan, cream, mustard and deep burgundy. During the 1920s, more intense colors began to be used, but the classic palette remains the most popular. There can't be enough said about built-ins for bungalow designs. Architects and designers took advantage of every nook and cranny to create a built-in feature. These included shelving, bookcases, hutches, buffets, benches, cabinets with a drop-down ironing board, Murphy wall beds and later, telephone nooks usually placed in hallways. The living room's main feature was the fireplace, but what made it such a special highlight to the room design was the built-in cabinets or open shelves that surrounded the fireplace. Small windows were often placed on either side of the fireplace above the cabinets/shelves. Bathrooms and kitchens featured floor-to-ceiling cabinets often with glass-paned doors. The cabinets reached to the ceiling. The bathroom cabinet usually had a mirrored medicine cabinet insert. Drawers filled the lower portion with cabinet doors above. Bathroom woodwork, especially wood trim, was painted white. The kitchen cabinets often stopped beneath the plate-rail. A plate rail consists of a rail or narrow shelf installed about 2 feet from the ceiling to display plates and other collectibles. Cabinets were painted either an off-white or simply varnished for a natural finish. China cabinets were built-in the butler's pantry (small prep room between kitchen and dining room), just off the kitchen, or in smaller homes, incorporated into the kitchen design. Dining rooms featured built-in buffets with open shelving above a counter space and cabinets and/or drawers below. A beveled glass splashback behind the counter space often completed this novelty. China cabinet in corners were built-in opportunities featuring imbedded ironwork patterns and beveled glass. Some boasted Arts and Crafts or Mission style stained glass. Geometric paneling or wainscoting were some dining room details. Wood trim and paneling are hallmarks of bungalow homes. Either box paneling or batten and board was used either below chair rail heights, three-quarters of the wall space, or at plate-rail height. All styles were acceptable. Wood species used for floors, trim, doors, and construction were those found within the region and dressed at the local mill. Pine, oak, and maple were the most commonly used woods, followed by gumwood, fir, and cypress. Different wood species were sometimes mixed as accent pieces to create design interest. Stains ranged from a golden oak color to a darker brown. Other stains included a bronze-like green and a more popular dull black. While built-ins and woodwork are important main features, don't forget to match the doors, floors, and fireplaces with the design. 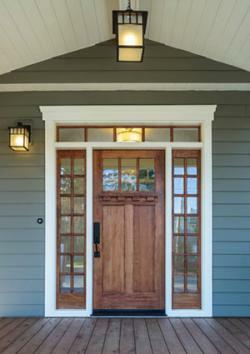 Exterior doors: Use a solid stained wood Craftsman door style. Details include square corner hinges, an upper window with one rectangular glass or three individual vertical panes and a dentil shelf underneath the window. The lower 3/4 of the door features board-and-batten. Doors are never painted, but stained. The door glass was often an Arts and Crafts stained glass design. Interior doors: French doors featuring Prairie grid panes and pocket doors were popular interior door choices. Recessed or raised panels either horizontal (with five panels being popular) or vertical panels were also used. Curtains were hung in doorways for added color and pattern. Flooring: Plank wood, stone, or terra cotta are choice picks for flooring. In California bungalows, tile flooring was used due to the region and availability. Plank floors were typically stained, often in a dark hue, and then sealed. Area rugs: Rugs were made using the designs of famous textile designers/artists Morris, Voysey, and Morton. 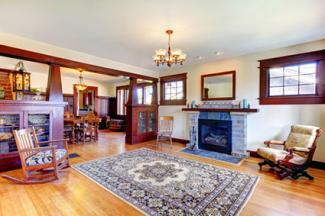 Choose an Arts and Crafts inspired rug or two along with simple solid colored rugs. Fireplace: Stacked fieldstone or brick fireplaces are a main feature. 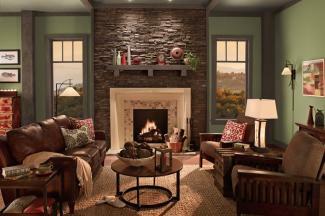 You can use a stone veneer over an existing fireplace to recreate this look. The fireplace surround and mantel were often used to show off craftsmanship with tile-work. Mantel designs: A Mission style mantel like the front door dentil shelf was used, only on a larger scale. Some designs also created mantels from stone or brick while others used rustic wood mantels. The space between the ceiling and picture rail was also decorated. This could be with embossed tin, leather, stenciled or hand-painted designs. The frieze, a wide horizontal band of patterns either sculpted or painted, was used in the space between the ceiling and chair rail/paneling and above the picture-rail. An elaborate choice was Lincrusta, a linum (linoleum-like) embossed with an Arts and Crafts pattern. Paintable embossed wallpaper was also used. Word art isn't a new fad and was highly used in home libraries and dining rooms featuring quotations or mottos. Crown moldings: This molding is wide and stained to match other woodwork. Wood beams: Select from boxed beams or running beams as well as rough-hewn and whole log overhead beams. Geometric patterns: Moldings were used on the ceiling instead of beams and formed into geometric patterns. Ceiling paint: The ceiling was never painted white. A hue that complemented the dark beams was the norm. This helped to maintain the warm cozy ambiance of the room. Wallpaper: Ceilings were often covered with a wallpaper pattern that complemented the pattern used on the walls. Craftsman or Mission style light fixtures featuring mica shades or geometric Tiffany Mission designs are a must. Wall sconces and table lamps also followed this design style of using warm colored metals such as copper and bronze. A Mission chandelier can be placed in the center of the living area, over the dining table and breakfast nook table. Use Mission pendant lights over the kitchen bar and a Mission overhead light in the center of kitchen. If desired, use modern recessed lights. Light switches and plates: Be authentic with push button light switches and cover plates. Walls can be done in a number of ways. 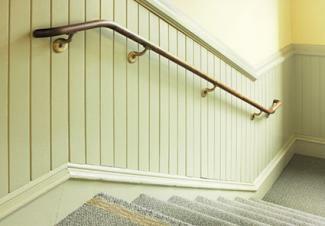 Wainscoting: Boxed-style paneling or beaded board were used for wainscoting. They were stained to go with the rest of the woodwork and trim. Different wood species were often used to highlight different grains and finishes. Batten and board: A style used instead of box paneling, it consisted of non-overlapping vertical wide boards. Narrow wood strips (battens) were nailed on top of two boards to cover the seam. Picture rail: Like the plate-rail, this strip of molding was placed two feet from the ceiling. Picture rails served only one purpose -- to accommodate picture hooks supported picture and mirror hanging cords/wires. Stenciling or wallpaper: Add stencils, or wallpaper designs to walls. You may also like stenciled borders too. Wallpaper: William Morris wallpapers were all the rage for bungalow homes as were geometric designs. A wallpaper was used above the chair-rail with a matching frieze above the plate-rail and often complemented with a different pattern on the ceiling. Wall hangings: Wall tapestries and other handmade wall hangings depicted Arts and Crafts designs. 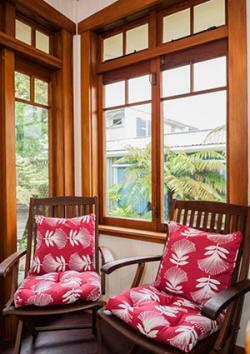 Use a window treatment that reflects the bungalow style. The windows themselves also add to the overall scheme. 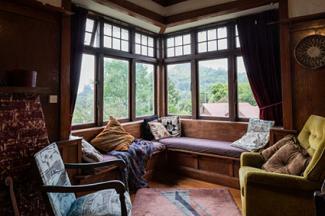 Windows: Double-hung windows or mission style with paned upper portions often feature stained-glass accents. Window painting: Windows were painted in two contrasting colors. For example, the window frame and sash were painted the same color while the window trim was painted a contrasting color. Draperies: Functionality carried over to drapery designs. A sheer curtain and a heavier curtain were often topped by a valance. Behind the sheer curtain was a roller shade. Pleated sage, cream colored, or mustard colored draperies or pocket rod curtain panels were used. Lace curtains often feature embroidered Arts and Crafts patterns. Picture hanging: Decorative hooks that fit over picture rails were used to support picture hanging cords/wires. Furniture choices should strike a balance between architectural features and furnishings for the best bungalow look. Whatever wood was used inside the home usually dictated the species of wood selected for furniture buys for a cohesive design. Other styles used included rattan and wicker. Mahogany was saved for painted rooms like bedrooms to showcase the wood. Sturdy wood furniture like the Mission designs was an ideal furniture choice. Upholstery choices included cotton, leather and linen. You can also mix similar styles and even go with a few overstuffed leather chairs. Upholstery fabrics: Muted damask, jacquard, and chenille fabrics give cozy textures. Pillows: Geometric patterns, velvet designs, tapestry, and needlepoint pillows can also be decorated with tassels and fringe. Collect a few vintage pieces to use for layering and creating design depth. Select wall art, pottery, mirrors, embroidered table scarves and bedspreads to reflect this vintage design. For example, a few pieces of authentic or reproduction depression glass, pottery and stained glass pieces will give your home that real bungalow touch. Hammered copper hardware and fixtures will lend authenticity to your bungalow design in virtually any room. Include the hardware and fixtures as part of your walls, doors, cabinetry, and even lighting. Go with vintage or modern reproductions to create your bungalow design. You can add as many design elements as desired to give your design an authentic look.